Braun Productions is known for its amazing line of professional aerial equipment and it’s private rehearsal and training studio. Our line of unique rental equipment and aerial consulting services have been used by major casinos, world wide touring artists and corporate event planners the world over. What sets us apart is our distinct ability to merge theater & aerial arts with design, technology & innovation. We will create an unmatched aerial number for your event, festival or private party that fits seamlessly within your vision and budget. Braun Productions has an full line of specialized equipment and high-speed motors for rent. Below are just a few of the many exciting pieces available that will create that jaw dropping moment for your guests. Feel free to contact us for creative input on how best to deliver on your vision. The Diamond Ring is a perfect touch of elegance for any formal or wedding event. This amazing aerial act is a romantic blend of spinning jaw dropping feats. Usually performed by a male and female duet, this gleaming 4 minute piece is sure to be the hit of any occasion. The prop itself can also be used as a stunning decor piece, draped in fabric to create that WOW factor for any entrance or center piece display. The aerial hoop or “Lyra” as it’s commonly known, is a circular apparatus suspended on a single pick point on which amazing high flying acrobatic tricks can be performed. This single performer routine can be customized to fit any theme. This amazing aerial apparatus is a very versatile piece of equipment that is usually performed as a duet. Perfect for smaller venues. Two bodies intertwined create visions of strength and elegance with a dramatic flair. This amazing aerial act is a fast paced blend of spinning jaw dropping feats. Can be performed by a duet or group of aerialist. The prop itself can also be used as a stunning decor piece, draped in fabric to create that WOW factor for any entrance or center piece display. This amazing aerial act is a fast paced blend of spinning jaw dropping feats. Can be performed by a duet or group of aerialist. This prop comes in two versions. The one displayed is our standard unit. The deluxe model is custom built to order and has brilliant programable LED’s that cover the sphere. This version creates an instant impact and is designed to WOW! 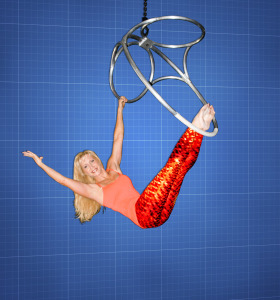 This beautiful aerial apparatus is a different version of the standard Lyra hoop. Can be performed by a duet or group of aerialist. The prop itself can also be used as a stunning decor piece, draped in fabric to create that WOW factor for any entrance or center piece display. This beautiful aerial apparatus is a unique prop that can be used in an elegant setting. Can be performed by a duet or group of aerialist. The prop itself can also be used as a stunning decor piece, draped in fabric to create that WOW factor for any entrance or center piece display.